The most fundamental transformation in 3D graphics is the perspective transformation that projects points in 3D space onto the 2D image plane. In Actionscript, this is referred to as a Perspective Projection. This transformation is absolutely essential to creating an image from a 3D model. Most models are composed of sets of points. So, we will show how to project a single 3D point onto a 2D image. Once you know how to project a point, you can project virtually any complex object in 3D. For example, you can project a polygon by projecting each vertex, individually. Once the vertices are projected, you can connect them to create the projected polygon. 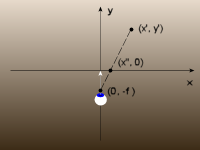 In general, a point (x’, y’) is transformed to (x”, 0) by x” = x’*(1/(y’ + 1)). This result can be further generalized by allowing the viewpoint to be anywhere on the negative y-axis. Here’s we have the viewpoint at (0, -f), and f is refered to as the focal length. Here, the point (x’, y’) is transformed to (x”, 0) by x” = x’*(f/(y’ + f)) in much the same way as before. Unlike the x-axis, images have finite length. Here, we used the interval [-w/2, w/2] to represent a one dimensional image with its width equal to w. If we project a point to the x-axis and it falls outside of this interval, it will not show up in our image. In this case, we say that the point is clipped. However, the finite image size presents us with an opportunity to define the field of view. 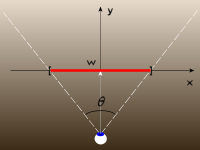 The field of view is the angle θ defined at the viewpoint that encompasses the image width. By trigonometry, we have tan(θ/2) = (w/2)/f. So, the focal length, f, can be written in terms of the image width, w, and field of view like this f = w/(2*tan(θ/2)). 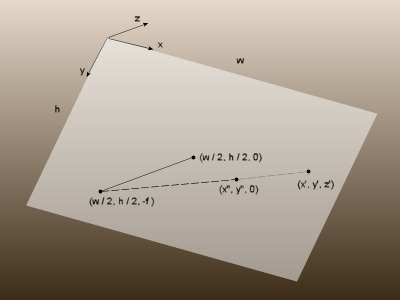 In Actionscript, perspective transformations are accomplished by the PerspectiveProjection class, which has three members named: fieldOfView, focalLength, and projectionCenter. These properties correspond to the field of view, the focal length, and the projection center, respectively. Keep in mind that the focal length and the field of view are not independent, but are related by the formula above. So, changing the value of one will change the other. The field of view is not used in the projection equations, but it is used as a convenient way to understand how projections work and set the focal length. This entry was posted on Sunday, June 12th, 2011 at 1:45 pm and is filed under Actionscript. You can follow any responses to this entry through the RSS 2.0 feed. You can leave a response, or trackback from your own site.